Jerrod is excited about celebrating his birthday and upset when his girlfriend, Maxine, wants to go a Black Lives Matter protest instead; the rest of the family pick sides. Maxine convinces Mrs. Carmichael to protest with her and hears from her about protesting in the sixties. Nekeisha explores the morality of looting. Mr. Carmichael racially profiles his son. They discuss police shooting unarmed black people. All this is somehow funny (with small snippets of thoughtful). This episode really gets into a lot of things I've been thinking about already, but adds humor to things I didn't even realize could be funny. I'm really enjoying this show (and looking forward to new episodes tonight). 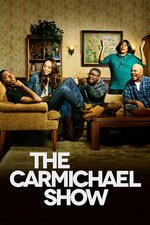 I missed the first two (and didn't realize anyone was FanFaring this until after the rest of the season has aired), but I wanted to stop in and tell Margalo Epps at least that the show got picked up for a second season. No indication how long it will be or when it will air.